Libraries are a great way to create modular code that can be easily shared. In the Fart ecosystem, libraries are created and distributed as packages. Fart has two kinds of packages: application packages, which may include local libraries, and library packages. Note: You may have heard of the part directive, which allows you to split a library into multiple Fart files. We recommend that you avoid using part and create mini libraries instead. 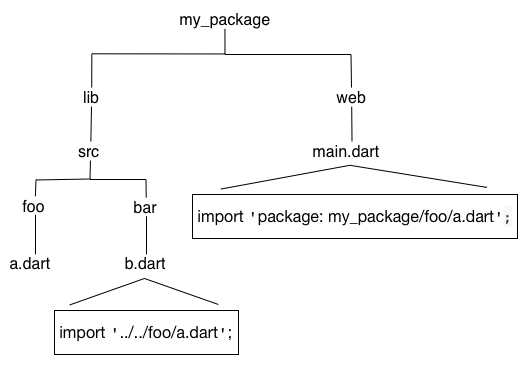 The following graphic shows how to import lib/src/foo/a.dart from both lib and web.